The trend of games that reward you while punishing you at the same time is a trend I honestly do not get. The reward at the end does taste that much sweeter when beating that level you've been stuck on for three days, or that boss who keeps killing you. But for me now in my older years, I just find myself losing patience with a game that constantly slaps me about a little while mocking my gaming skills like a bully would. 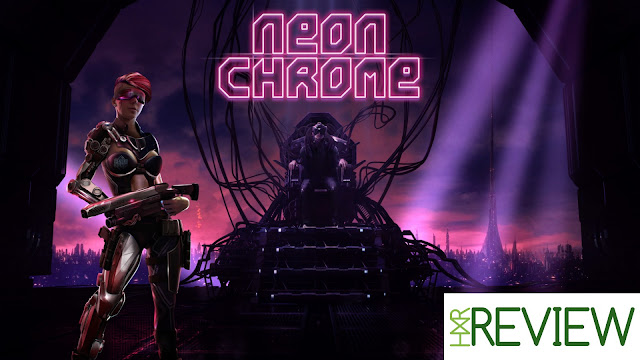 I went into Neon Chrome not really knowing what to expect in truth, but having been somewhat of a fan of the stuff by 10Tons before, I went into half expecting to enjoy what the team had made for us this time around. Neon Chrome is a top-down shooter with the whole cyberpunk look going for it, but it's also a game that is so tough that it has seen me putting this review off for what feels like ages because I found myself questioning my own gaming ability. This is how the game plays out. 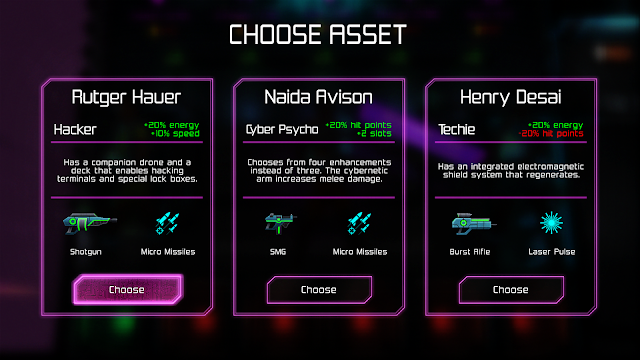 At the start of the game you get to choose from three randomly generated characters (or assets as the game calls them, all of which offer something different from the others. Say one guy/girl has 20% extra speed, and the other guy/girl has 15% more damage. Pick your character (asset) and then it's your goal to tackle the 32 procedurally generated levels to reach the end of the game. I'm not going to lie to you all, I think the highest level I've reached in the game so far is about level four. Bearing in mind this has seen around 25 poor assets dying to get just there. Upon on each death you get to choose a new asset to go at the game again right from level one, only this time around you can buy a ton of things with cash you earned on your previous run to hopefully help you get that little bit further in the game (never helped me at all). You can make the following stats up to a 100 with cash you earn by shooting things and looting. In the main ones you can add to your health, how much damage you dish out, luck (more cash when looting and better critical hits on enemies), Energy (more power for special abililties), and finally slots which allow you to add more abilites in when playing a level. You can also buy new weapons, abilities, and new enhancements for yourself along the way. Like I said earlier mind, I've done this around 25 times now and still find myself sucking, so the chances of you sticking with the game if your patience wears very thin is slim to none. 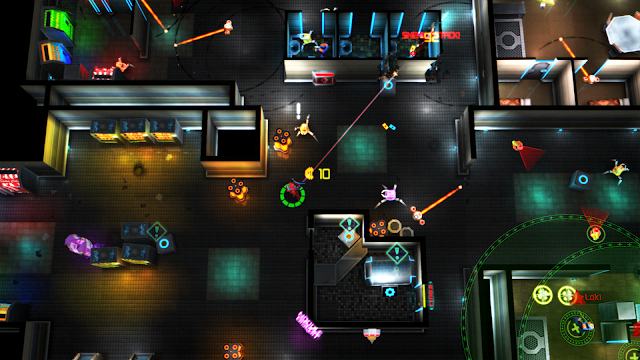 Overall: Neon Chrome is a punishing game that is not going to be to the taste of everyone. Those who love a challenge and being rewarded by sticking with a game after numerous deaths will get a lot more out of the game than I did. It's nice to see 10Tons mixing things up though. So for me and my sucky gaming skills to fully push the game away as not worth your time would be unfair to them. If you enjoyed games like Super Smash TV back in the day, then this could be the game for you.